In areas where S.alveolata reefs develop, they play important and varied ecological roles. All S. alveolata reefs, and in particular those which develop on soft substrata, host highly diverse and unique species assemblages which are distinct from their immediate surroundings. The reefs shelter a high number of species (species richness) due to their small-scale topographic environmental complexity, which creates numerous spatial and trophic niches for colonisation by other invertebrates. A small recess in the reef filled with silt in which burrowing anemones have settled (small holes). Grand platier récifal montrant les cuvettes formées au sein du récif et dans lesquelles de nombreuses espèces se développent. In the Mont-Saint-Michel Bay, studies have revealed that the average number of species is 5 times higher in the reefs than in the neighbouring sediments. The species assemblages encountered are also very different. 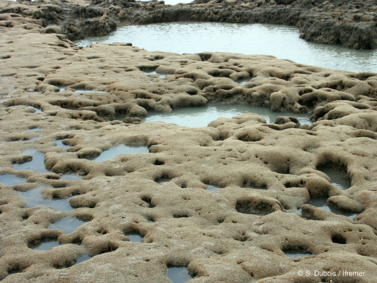 Reefs create an environment where multiple habitats can co-occur: species originating from hard substrata, muddy and sandy sedimentary habitats, in addition to both subtidal and intertidal habitats can all be found. Some species appear to be found only on Sabellaria alveolata reefs, such as some small gasteropods (Noemiamea dolioliformis) or roundworms (nematodes). Finally, studies have demonstrated that each stage in the cycle of reef development (veneer, hummock, platform) hosts different associated fauna (Dubois et al. 2002). In conclusion, the physical structure created by S.alveolata creates a habitat broadly considered as a hotspot of biodiversity. The amount of water filtered by an individual Sabellaria alveolata to feed itself is very small, however their density, which can exceed 30 000 individuals.m-2 make Sabellaria alveolata reefs important biological filters. It has been calculated that a square meter of reef can filter on average lire than 50 litres of water per hour (Dubois et al. 2009). In areas of high productivity, the reefs actively contribute towards the transfer of organic matter into the ecosystem where they develop. In addition to their role as a primary consumer of phytoplankton, honeycomb worms represent a food source for several vertebrates and invertebrates. Many crabs (Cancer pagurus, Carcinus maenas) and rock fish (Blennius pholis) live in the reef recesses and feed on the worms. Some flatfish (Solea solea) also purposefully swim onto the reefs at high tide in order to "graze" on the worms heads. The largest honeycomb worm reef develop in sandy environments characterised by dynamic sediment movement. 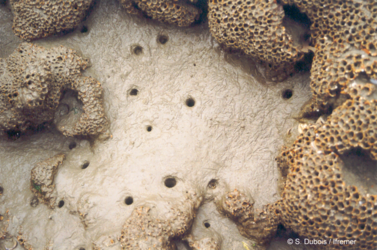 Clean medium-sized mobile sand contains a high proportion of shell fragments (called bioclasts) which are actively selected by the honeycomb worms for tube construction. It has been shown that their tubes are composed of between 60 and 80% calcium carbonate. Whilst the resultant dense and solid structures do not produce carbonate in the same manner as bivalve or coral reefs, they trap carbonate-rich sediments and actively control the composition of the surrounding sediments through preferential selection of sand grains.